The Enneads are a collection of writings that the great Roman Neo-Platonist, Plotinus, left behind at his death in the 3rd century CE, and that were compiled and edited by his student and successor, Porphory. 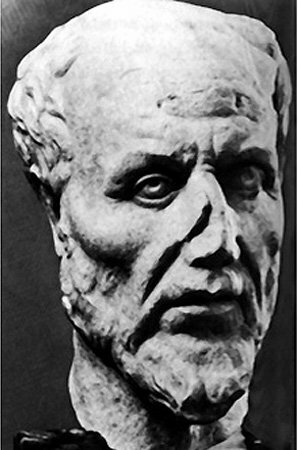 Plotinus was director of the Academy that Plato had established 500 years earlier, and his life's work was devoted to developing Plato's thinking in a more complete and systematic direction than the master himself had attempted, at least in his written dialogues. In the Enneads, Plotinus accounts for the visible cosmos as the final result of a multi-stage process of "emanation." All of reality originates in a pole of absolute unity, beauty, and moral perfection that Plato called The Form of The Good, and Plotinus renames The One. The One expresses or unfolds its implicit content in the form of a second manifestation, Nous, or the Divine Mind. The forms that Plato wrote about are located here, unified by the pure acts of thought that grasp them. Nous in turn gives rise to a third manifestation, Psyche, the "world soul" that Plato described in his Timeus. The world soul animates the visible cosmos, making it a unitary living organism, the parts of which are themselves organisms animated by their own particular souls. Human beings have a privileged position among these organisms because they are capable of understanding the ensouled order of the cosmos as a whole, rising from there to a grasp of the more sublime order and unity of the Divine Mind and its ideal forms, and ending in an ecstatic vision of The One, the ultimate origin of all goodness, beauty, and being. The 4th Ennead, from which the passages below were taken, is titled "Problems of the Soul," referring to both the souls of individual organisms and that of the cosmos. When I speak of the act and experience of the All I mean the total effect of the entire cosmic circuit upon itself and upon its members: for by its motion it sets up certain states both within itself and upon its parts, upon the bodies that move within it and upon all that it communicates to those other parts of it, the things of our earth. The action of part upon part is manifest; there are the relations and operations of the sun, both towards the other spheres and towards the things of earth; and again relations among elements of the sun itself, of other heavenly bodies, of earthly things and of things in the other stars, demand investigation. As for the arts: Such as look to house building and the like are exhausted when that object is achieved; there are again those- medicine, farming, and other serviceable pursuits- which deal helpfully with natural products, seeking to bring them to natural efficiency; and there is a class- rhetoric, music and every other method of swaying mind or soul, with their power of modifying for better or for worse- and we have to ascertain what these arts come to and what kind of power lies in them. On all these points, in so far as they bear on our present purpose, we must do what we can to work out some approximate explanation. It is abundantly evident that the Circuit is a cause; it modifies, firstly, itself and its own content, and undoubtedly also it tells on the terrestrial, not merely in accordance with bodily conditions but also by the states of the soul it sets up; and each of its members has an operation upon the terrestrial and in general upon all the lower. Whether there is a return action of the lower upon the higher need not trouble us now: for the moment we are to seek, as far as discussion can exhibit it, the method by which action takes place; and we do not challenge the opinions universally or very generally entertained. We take the question back to the initial act of causation. It cannot be admitted that either heat or cold and the like what are known as the primal qualities of the elements- or any admixture of these qualities, should be the first causes we are seeking; equally inacceptable, that while the sun's action is all by heat, there is another member of the Circuit operating wholly by cold- incongruous in the heavens and in a fiery body- nor can we think of some other star operating by liquid fire. Such explanations do not account for the differences of things, and there are many phenomena which cannot be referred to any of these causes. Suppose we allow them to be the occasion of moral differences- determined, thus, by bodily composition and constitution under a reigning heat or cold- does that give us a reasonable explanation of envy, jealously, acts of violence? Or, if it does, what, at any rate, are we to think of good and bad fortune, rich men and poor, gentle blood, treasure-trove? An immensity of such examples might be adduced, all leading far from any corporeal quality that could enter the body and soul of a living thing from the elements: and it is equally impossible that the will of the stars, a doom from the All, any deliberation among them, should be held responsible for the fate of each and all of their inferiors. It is not to be thought that such beings engage themselves in human affairs in the sense of making men thieves, slave-dealers, burglars, temple-strippers, or debased effeminates practising and lending themselves to disgusting actions: that is not merely unlike gods; it is unlike mediocre men; it is, perhaps, beneath the level of any existing being where there is not the least personal advantage to be gained. 32. If we can trace neither to material agencies [blind elements] nor to any deliberate intention the influences from without which reach to us and to the other forms of life and to the terrestrial in general, what cause stisfactory to reason remains? The secret is: firstly, that this All is one universally comprehensive living being, encircling all the living beings within it, and having a soul, one soul, which extends to all its members in the degree of participant membership held by each; secondly, that every separate thing is an integral part of this All by belonging to the total material fabric- unrestrictedly a part by bodily membership, while, in so far as it has also some participation in the All. Soul, it possesses in that degree spiritual membership as well, perfect where participation is in the All-Soul alone, partial where there is also a union with a lower soul. But, with all this gradation, each several thing is affected by all else in virtue of the common participation in the All, and to the degree of its own participation. This One-All, therefore, is a sympathetic total and stands as one living being; the far is near; it happens as in one animal with its separate parts: talon, horn, finger, and any other member are not continuous and yet are effectively near; intermediate parts feel nothing, but at a distant point the local experience is known. Correspondent things not side by side but separated by others placed between, the sharing of experience by dint of like condition- this is enough to ensure that the action of any distant member be transmitted to its distant fellow. Where all is a living thing summing to a unity there is nothing so remote in point of place as not to be near by virtue of a nature which makes of the one living being a sympathetic organism. Where there is similarity between a thing affected and the thing affecting it, the affection is not alien; where the affecting cause is dissimilar the affection is alien and unpleasant. Such hurtful action of member upon member within one living being need not seem surprising: within ourselves, in our own activities, one constituent can be harmed by another; bile and animal spirit seem to press and goad other members of the human total: in the vegetal realm one part hurts another by sucking the moisture from it. And in the All there is something analogous to bile and animal spirit, as to other such constituents. For visibly it is not merely one living organism; it is also a manifold. In virtue of the unity the individual is preserved by the All: in virtue of the multiplicity of things having various contacts, difference often brings about mutual hurt; one thing, seeking its own need, is detrimental to another; what is at once related and different is seized as food; each thing, following its own natural path, wrenches from something else what is serviceable to itself, and destroys or checks in its own interest whatever is becoming a menace to it: each, occupied with its peculiar function, assists no doubt anything able to profit by that, but harms or destroys what is too weak to withstand the onslaught of its action, like fire withering things round it or greater animals in their march thrusting aside or trampling under foot the smaller. The rise of all these forms of being and their modification, whether to their loss or gain, all goes to the fulfillment of the natural unhindered life of that one living being: for it was not possible for the single thing to be as if it stood alone; the final purpose could not serve to that only end, intent upon the partial: the concern must be for the whole to which each item is member: things are different both from each other and in their own stages, therefore cannot be complete in one unchanging form of life; nor could anything remain utterly without modification if the All is to be durable; for the permanence of an All demands varying forms. 33. The Circuit does not go by chance but under the Reason-Principle of the living whole; therefore there must be a harmony between cause and caused; there must be some order ranging things to each other's purpose, or in due relation to each other: every several configuration within the Circuit must be accompanied by a change in the position and condition of things subordinate to it, which thus by their varied rhythmic movement make up one total dance-play. In our dance-plays there are outside elements contributing to the total effect- fluting, singing, and other linked accessories- and each of these changes in each new movement: there is no need to dwell on these; their significance is obvious. But besides this there is the fact that the limbs of the dancer cannot possibly keep the same positions in every figure; they adapt themselves to the plan, bending as it dictates, one lowered, another raised, one active, another resting as the set pattern changes. The dancer's mind is on his own purpose; his limbs are submissive to the dance-movement which they accomplish to the end, so that the connoisseur can explain that this or that figure is the motive for the lifting, bending, concealment, effacing, of the various members of the body; and in all this the executant does not choose the particular motions for their own sake; the whole play of the entire person dictates the necessary position to each limb and member as it serves to the plan. Now this is the mode in which the heavenly beings [the diviner members of the All] must be held to be causes wherever they have any action, and, when. they do not act, to indicate. Or, a better statement: the entire cosmos puts its entire life into act, moving its major members with its own action and unceasingly setting them in new positions; by the relations thus established, of these members to each other and to the whole, and by the different figures they make together, the minor members in turn are brought under the system as in the movements of some one living being, so that they vary according to the relations, positions, configurations: the beings thus co-ordinated are not the causes; the cause is the coordinating All; at the same time it is not to be thought of as seeking to do one thing and actually doing another, for there is nothing external to it since it is the cause by actually being all: on the one side the configurations, on the other the inevitable effects of those configurations upon a living being moving as a unit and, again, upon a living being [an All] thus by its nature conjoined and concomitant and, of necessity, at once subject and object to its own activities. 34. For ourselves, while whatever in us belongs to the body of the All should be yielded to its action, we ought to make sure that we submit only within limits, realizing that the entire man is not thus bound to it: intelligent servitors yield a part of themselves to their masters but in part retain their personality, and are thus less absolutely at beck and call, as not being slaves, not utterly chattels. The changing configurations within the All could not fail to be produced as they are, since the moving bodies are not of equal speed. Now the movement is guided by a Reason-Principle; the relations of the living whole are altered in consequence; here in our own realm all that happens reacts in sympathy to the events of that higher sphere: it becomes, therefore, advisable to ask whether we are to think of this realm as following upon the higher by agreement, or to attribute to the configurations the powers underlying the events, and whether such powers would be vested in the configurations simply or in the relations of the particular items. It will be said that one position of one given thing has by no means an identical effect- whether of indication or of causation- in its relation to another and still less to any group of others, since each several being seems to have a natural tendency [or receptivity] of its own. The truth is that the configuration of any given group means merely the relationship of the several parts, and, changing the members, the relationship remains the same. But, this being so, the power will belong, not to the positions but to the beings holding those positions? To both taken together. For as things change their relations, and as any one thing changes place, there is a change of power. But what power? That of causation or of indication? To this double thing- the particular configuration of particular beings- there accrues often the twofold power, that of causation and that of indication, but sometimes only that of indication. Thus we are obliged to attribute powers both to the configuration and to the beings entering into them. In mime dancers each of the hands has its own power, and so with all the limbs; the relative positions have much power; and, for a third power, there is that of the accessories and concomitants; underlying the action of the performers' limbs, there are such items as the clutched fingers and the muscles and veins following suit. 35. But we must give some explanation of these powers. The matter requires a more definite handling. How can there be a difference of power between one triangular configuration and another? How can there be the exercise of power from man to man; under what law, and within what limits? The difficulty is that we are unable to attribute causation either to the bodies of the heavenly beings or to their wills: their bodies are excluded because the product transcends the causative power of body, their will because it would be unseemly to suppose divine beings to produce unseemliness. The being we are considering is a living unity and, therefore, necessarily self-sympathetic: it is under a law of reason, and therefore the unfolding process of its life must be self-accordant: that life has no haphazard, but knows only harmony and ordinance: all the groupings follow reason: all single beings within it, all the members of this living whole in their choral dance are under a rule of Number. Holding this in mind we are forced to certain conclusions: in the expressive act of the All are comprised equally the configurations of its members and these members themselves, minor as well as major entering into the configurations. This is the mode of life of the All; and its powers work together to this end under the Nature in which the producing agency within the Reason-Principles has brought them into being. The groupings [within the All] are themselves in the nature of Reason-Principles since they are the out-spacing of a living-being, its reason-determined rhythms and conditions, and the entities thus spaced-out and grouped to pattern are its various members: then again there are the powers of the living being- distinct these, too- which may be considered as parts of it, always excluding deliberate will which is external to it, not contributory to the nature of the living All. The will of any organic thing is one; but the distinct powers which go to constitute it are far from being one: yet all the several wills look to the object aimed at by the one will of the whole: for the desire which the one member entertains for another is a desire within the All: a part seeks to acquire something outside itself, but that external is another part of which it feels the need: the anger of a moment of annoyance is directed to something alien, growth draws on something outside, all birth and becoming has to do with the external; but all this external is inevitably something included among fellow members of the system: through these its limbs and members, the All is bringing this activity into being while in itself it seeks- or better, contemplates- The Good. Right will, then, the will which stands above accidental experience, seeks The Good and thus acts to the same end with it. When men serve another, many of their acts are done under order, but the good servant is the one whose purpose is in union with his master's. In all the efficacy of the sun and other stars upon earthly matters we can but believe that though the heavenly body is intent upon the Supreme yet- to keep to the sun- its warming of terrestrial things, and every service following upon that, all springs from itself, its own act transmitted in virtue of soul, the vastly efficacious soul of Nature. Each of the heavenly bodies, similarly, gives forth a power, involuntary, by its mere radiation: all things become one entity, grouped by this diffusion of power, and so bring about wide changes of condition; thus the very groupings have power since their diversity produces diverse conditions; that the grouped beings themselves have also their efficiency is clear since they produce differently according to the different membership of the groups. That configuration has power in itself is within our own observation here. Why else do certain groupments, in contradistinction to others, terrify at sight though there has been no previous experience of evil from them? If some men are alarmed by a particular groupment and others by quite a different one, the reason can be only that the configurations themselves have efficacy, each upon a certain type- an efficacy which cannot fail to reach anything naturally disposed to be impressed by it, so that in one groupment things attract observation which in another pass without effect. If we are told that beauty is the motive of attraction, does not this mean simply that the power of appeal to this or that mind depends upon pattern, configuration? How can we allow power to colour and none to configuration? It is surely untenable that an entity should have existence and yet have no power to effect: existence carries with it either acting or answering to action, some beings having action alone, others both. At the same time there are powers apart from pattern: and, in things of our realm, there are many powers dependent not upon heat and cold but upon forces due to differing properties, forces which have been shaped to ideal-quality by the action of Reason-Principles and communicate in the power of Nature: thus the natural properties of stones and the efficacy of plants produce many astonishing results. 36. The Universe is immensely varied, the container of all the Reason-Principles and of infinite and diverse efficacies. In man, we are told, the eye has its power, and the bones have their varied powers, and so with each separate part of hand and of foot; and there is no member or organ without its own definite function, some separate power of its own- a diversity of which we can have no notion unless our studies take that direction. What is true of man must be true of the universe, and much more, since all this order is but a representation of the higher: it must contain an untellably wonderful variety of powers, with which, of course, the bodies moving through the heavens will be most richly endowed. We cannot think of the universe as a soulless habitation, however vast and varied, a thing of materials easily told off, kind by kind- wood and stone and whatever else there be, all blending into a cosmos: it must be alert throughout, every member living by its own life, nothing that can have existence failing to exist within it. And here we have the solution of the problem, "How an ensouled living form can include the soulless": for this account allows grades of living within the whole, grades to some of which we deny life only because they are not perceptibly self-moved: in the truth, all of these have a hidden life; and the thing whose life is patent to sense is made up of things which do not live to sense, but, none the less, confer upon their resultant total wonderful powers towards living. Man would never have reached to his actual height if the powers by which he acts were the completely soulless elements of his being; similarly the All could not have its huge life unless its every member had a life of its own; this however does not necessarily imply a deliberate intention; the All has no need of intention to bring about its acts: it is older than intention, and therefore its powers have many servitors. 37. We must not rob the universe of any factor in its being. If any of our theorists of to-day seek to explain the action of fire- or of any other such form, thought of as an agent- they will find themselves in difficulties unless they recognize the act to be the object's function in the All, and give a like explanation of other natural forces in common use. We do not habitually examine or in any way question the normal: we set to doubting and working out identifications when we are confronted by any display of power outside everyday experience: we wonder at a novelty and we wonder at the customary when anyone brings forward some single object and explains to our ignorance the efficacy vested in it. Some such power, not necessarily accompanied by reason, every single item possesses; for each has been brought into being and into shape within a universe; each in its kind has partaken of soul through the medium of the ensouled All, as being embraced by that definitely constituted thing: each then is a member of an animate being which can include nothing that is less than a full member [and therefore a sharer in the total of power]- though one thing is of mightier efficacy than another, and, especially members of the heavenly system than the objects of earth, since they draw upon a purer nature- and these powers are widely productive. But productivity does not comport intention in what appears to be the source of the thing accomplished: there is efficacy, too, where there is no will: even attention is not necessary to the communication of power; the very transmission of soul may proceed without either. A living being, we know, may spring from another without any intention, and as without loss so without consciousness in the begetter: in fact any intention the animal exercised could be a cause of propagation only on condition of being identical with the animal. And, if intention is unnecessary to the propagation of life, much more so is attention. 38. Whatever springs automatically from the All out of that distinctive life of its own, and, in addition to that self-moving activity, whatever is due to some specific agency - for example, to prayers, simple or taking the form of magic incantations - this entire range of production is to be referred, not to each such single cause, but to the nature of the thing produced [i.e., to a certain natural tendency in the product to exist with its own quality]. All that forwards life or some other useful purpose is to be ascribed to the transmission characteristic of the All; it is something flowing from the major of an integral to its minor. Where we think we see the transmission of some force unfavourable to the production of living beings, the flaw must be found in the inability of the subject to take in what would serve it: for what happens does not happen upon a void; there is always specific form and quality; anything that could be affected must have an underlying nature definite and characterized. The inevitable blendings, further, have their constructive effect, every element adding something contributory to the life. Then again some influence may come into play at the time when the forces of a beneficent nature are not acting: the co-ordination of the entire system of things does not always allow to each several entity everything that it needs: and further we ourselves add a great deal to what is transmitted to us. None the less all entwines into a unity: and there is something wonderful in the agreement holding among these various things of varied source, even of sources frankly opposite; the secret lies in a variety within a unity. When by the standard of the better kind among things of process anything falls short- the reluctance of its material substratum having prevented its perfect shaping under idea- it may be thought of as being deficient in that noble element whose absence brings to shame: the thing is a blend, something due to the high beings, an alloy from the underlying nature, something added by the self. Because all is ever being knit, all brought to culmination in unity, therefore all events are indicated; but this does not make virtue a matter of compulsion; its spontaneity is equally woven into the ordered system by the general law that the things of this sphere are pendant from the higher, that the content of our universe lies in the hands of the diviner beings in whom our world is participant. 39. We cannot, then, refer all that exists to Reason-Principles inherent in the seed of things [Spermatic Reasons]; the universe is to be traced further back, to the more primal forces, to the principles by which that seed itself takes shape. Such spermatic principles cannot be the containers of things which arise independently of them, such as what enters from Matter [the reasonless] into membership of the All, or what is due to the mere interaction of existences. No: the Reason-Principle of the universe would be better envisaged as a wisdom uttering order and law to a state, in full knowledge of what the citizens will do and why, and in perfect adaptation of law to custom; thus the code is made to thread its way in and out through all their conditions and actions with the honour or infamy earned by their conduct; and all coalesces by a kind of automatism. The signification which exists is not a first intention; it arises incidentally by the fact that in a given collocation the members will tell something of each other: all is unity sprung of unity and therefore one thing is known by way of another other, a cause in the light of the caused, the sequent as rising from its precedent, the compound from the constituents which must make themselves known in the linked total. If all this is sound, at once our doubts fall and we need no longer ask whether the transmission of any evil is due to the gods. For, in sum: Firstly, intentions are not to be considered as the operative causes; necessities inherent in the nature of things account for all that comes from the other realm; it is a matter of the inevitable relation of parts, and, besides, all is the sequence to the living existence of a unity. Secondly, there is the large contribution made by the individual. Thirdly, each several communication, good in itself, takes another quality in the resultant combination. Fourthly, the life in the cosmos does not look to the individual but to the whole. Finally, there is Matter, the underlie, which being given one thing receives it as something else, and is unable to make the best of what it takes. 40. But magic spells; how can their efficacy be explained? By the reigning sympathy and by the fact in Nature that there is an agreement of like forces and an opposition of unlike, and by the diversity of those multitudinous powers which converge in the one living universe. There is much drawing and spell-binding dependent on no interfering machination; the true magic is internal to the All, its attractions and, not less, its repulsions. Here is the primal mage and sorcerer- discovered by men who thenceforth turn those same ensorcellations and magic arts upon one another. Love is given in Nature; the qualities inducing love induce mutual approach: hence there has arisen an art of magic love-drawing whose practitioners, by the force of contact implant in others a new temperament, one favouring union as being informed with love; they knit soul to soul as they might train two separate trees towards each other. The magician too draws on these patterns of power, and by ranging himself also into the pattern is able tranquilly to possess himself of these forces with whose nature and purpose he has become identified. Supposing the mage to stand outside the All, his evocations and invocations would no longer avail to draw up or to call down; but as things are he operates from no outside standground, he pulls knowing the pull of everything towards any other thing in the living system. The tune of an incantation, a significant cry, the mien of the operator, these too have a natural leading power over the soul upon which they are directed, drawing it with the force of mournful patterns or tragic sounds- for it is the reasonless soul, not the will or wisdom, that is beguiled by music, a form of sorcery which raises no question, whose enchantment, indeed, is welcomed, exacted, from the performers. Similarly with regard to prayers; there is no question of a will that grants; the powers that answer to incantations do not act by will; a human being fascinated by a snake has neither perception nor sensation of what is happening; he knows only after he has been caught, and his highest mind is never caught. In other words, some influence falls from the being addressed upon the petitioner- or upon someone else- but that being itself, sun or star, perceives nothing of it all. 41. The prayer is answered by the mere fact that part and other part are wrought to one tone like a musical string which, plucked at one end, vibrates at the other also. Often, too, the sounding of one string awakens what might pass for a perception in another, the result of their being in harmony and tuned to one musical scale; now, if the vibration in a lyre affects another by virtue of the sympathy existing between them, then certainly in the All- even though it is constituted in contraries- there must be one melodic system; for it contains its unisons as well, and its entire content, even to those contraries, is a kinship. Thus, too, whatever is hurtful to man- the passionate spirit, for example, drawn by the medium of the gall into the principle seated in the liver- comes with no intention of hurt; it is simply as one transferring fire to another might innocently burn him: no doubt, since he actually set the other on fire he is a cause, but only as the attacking fire itself is a cause, that is by the merely accidental fact that the person to whom the fire was being brought blundered in taking it. 42. It follows that, for the purposes which have induced this discussion, the stars have no need of memory or of any sense of petitions addressed to them; they give no such voluntary attention to prayers as some have thought: it is sufficient that, in virtue simply of the nature of parts and of parts within a whole, something proceeds from them whether in answer to prayer or without prayer. We have the analogy of many powers- as in some one living organism- which, independently of plan or as the result of applied method, act without any collaboration of the will: one member or function is helped or hurt by another in the mere play of natural forces; and the art of doctor or magic healer will compel some one centre to purvey something of its own power to another centre. just so the All: it purveys spontaneously, but it purveys also under spell; some entity [acting like the healer] is concerned for a member situated within itself and summons the All which, then, pours in its gift; it gives to its own part by the natural law we have cited since the petitioner is no alien to it. Even though the suppliant be a sinner, the answering need not shock us; sinners draw from the brooks; and the giver does not know of the gift but simply gives- though we must remember that all is one woof and the giving is always consonant with the order of the universe. There is, therefore, no necessity by ineluctable law that one who has helped himself to what lies open to all should receive his deserts then and there. In sum, we must hold that the All cannot be affected; its leading principle remains for ever immune whatsoever happens to its members; the affection is really present to them, but since nothing existent can be at strife with the total of existence, no such affection conflicts with its impassivity. Thus the stars, in so far as they are parts, can be affected and yet are immune on various counts; their will, like that of the All, is untouched, just as their bodies and their characteristic natures are beyond all reach of harm; if they give by means of their souls, their souls lose nothing; their bodies remain unchanged or, if there is ebb or inflow, it is of something going unfelt and coming unawares. 43. And the Proficient [the Sage], how does he stand with regard to magic and philter-spells? In the soul he is immune from magic; his reasoning part cannot be touched by it, he cannot be perverted. But there is in him the unreasoning element which comes from the [material] All, and in this he can be affected, or rather this can be affected in him. Philtre-Love, however, he will not know, for that would require the consent of the higher soul to the trouble stiffed in the lower. And, just as the unreasoning element responds to the call of incantation, so the adept himself will dissolve those horrible powers by counter-incantations. Death, disease, any experience within the material sphere, these may result, yes; for anything that has membership in the All may be affected by another member, or by the universe of members; but the essential man is beyond harm. That the effects of magic should be not instantaneous but developed is only in accord with Nature's way. Even the Celestials, the Daimones, are not on their unreasoning side immune: there is nothing against ascribing acts of memory and experiences of sense to them, in supposing them to accept the traction of methods laid up in the natural order, and to give hearing to petitioners; this is especially true of those of them that are closest to this sphere, and in the degree of their concern about it. For everything that looks to another is under spell to that: what we look to, draws us magically. Only the self-intent go free of magic. Hence every action has magic as its source, and the entire life of the practical man is a bewitchment: we move to that only which has wrought a fascination upon us. This is indicated where we read "for the burgher of greathearted Erechtheus has a pleasant face [but you should see him naked; then you would be cautious]." For what conceivably turns a man to the external? He is drawn, drawn by the arts not of magicians but of the natural order which administers the deceiving draught and links this to that, not in local contact but in the fellowship of the philter. 44. Contemplation alone stands untouched by magic; no man self-gathered falls to a spell; for he is one, and that unity is all he perceives, so that his reason is not beguiled but holds the due course, fashioning its own career and accomplishing its task. In the other way of life, it is not the essential man that gives the impulse; it is not the reason; the unreasoning also acts as a principle, and this is the first condition of the misfortune. Caring for children, planning marriage- everything that works as bait, taking value by dint of desire- these all tug obviously: so it is with our action, sometimes stirred, not reasonably, by a certain spirited temperament, sometimes as foolishly by greed; political interests, the siege of office, all betray a forth-summoning lust of power; action for security springs from fear; action for gain, from desire; action undertaken for the sake of sheer necessities- that is, for supplying the insufficiency of nature- indicates, manifestly, the cajoling force of nature to the safeguarding of life. We may be told that no such magic underlies good action, since, at that, Contemplation itself, certainly a good action, implies a magic attraction. The answer is that there is no magic when actions recognized as good are performed upon sheer necessity with the recollection that the veritable good is elsewhere; this is simply knowledge of need; it is not a bewitchment binding the life to this sphere or to any thing alien; all is permissible under duress of human nature, and in the spirit of adaptation to the needs of existence in general- or even to the needs of the individual existence, since it certainly seems reasonable to fit oneself into life rather than to withdraw from it. When, on the contrary, the agent falls in love with what is good in those actions, and, cheated by the mere track and trace of the Authentic Good makes them his own, then, in his pursuit of a lower good, he is the victim of magic. For all dalliance with what wears the mask of the authentic, all attraction towards that mere semblance, tells of a mind misled by the spell of forces pulling towards unreality. The sorcery of Nature is at work in this; to pursue the non-good as a good, drawn in unreasoning impulse by its specious appearance: it is to be led unknowing down paths unchosen; and what can we call that but magic. Alone in immunity from magic is he who, though drawn by the alien parts of his total being, withholds his assent to their standards of worth, recognizing the good only where his authentic self sees and knows it, neither drawn nor pursuing, but tranquilly possessing and so never charmed away. 45. From this discussion it becomes perfectly clear that the individual member of the All contributes to that All in the degree of its kind and condition; thus it acts and is acted upon. In any particular animal each of the limbs and organs, in the measure of its kind and purpose, aids the entire being by service performed and counts in rank and utility: it gives what is in it its gift and takes from its fellows in the degree of receptive power belonging to its kind; there is something like a common sensitiveness linking the parts, and in the orders in which each of the parts is also animate, each will have, in addition to its rank as part, the very particular functions of a living being. We have learned, further, something of our human standing; we know that we too accomplish within the All a work not confined to the activity and receptivity of body in relation to body; we know that we bring to it that higher nature of ours, linked as we are by affinities within us towards the answering affinities outside us; becoming by our soul and the conditions of our kind thus linked- or, better, being linked by Nature- with our next highest in the celestial or demonic realm, and thence onwards with those above the Celestials, we cannot fail to manifest our quality. Still, we are not all able to offer the same gifts or to accept identically: if we do not possess good, we cannot bestow it; nor can we ever purvey any good thing to one that has no power of receiving good. Anyone that adds his evil to the total of things is known for what he is and, in accordance with his kind, is pressed down into the evil which he has made his own, and hence, upon death, goes to whatever region fits his quality- and all this happens under the pull of natural forces. For the good man, the giving and the taking and the changes of state go quite the other way; the particular tendencies of the nature, we may put it, transpose the cords [so that we are moved by that only which, in Plato's metaphor of the puppets, draws towards the best]. Among those making profession of Philosophy at Rome was one Olympius, an Alexandrian, who had been for a little while a pupil of Ammonius [Ammonius was Plotinus' teacher]. This man's jealous envy showed itself in continual insolence, and finally he grew so bitter that he even ventured sorcery, seeking to crush Plotinus by star-spells. But he found his experiments recoiling upon himself, and he confessed to his associates that Plotinus possessed 'a mighty soul, so powerful, as to be able to hurl every assault back upon those that sought his ruin'. Plotinus had felt the operation and declared that at that moment Olympius' 'limbs were convulsed and his body shrivelling like a money-bag pulled tight'. Olympius, perceiving on several attempts that he was endangering himself rather than Plotinus, desisted. The story is interesting in that it shows that Plotinus' interest in magic was not merely theoretical, since he lived in a world that regarded magic as a fact of everyday life. Porphory is probably mistaken, however, in claiming that Plotinus defeated his envious opponent by casting a counter-spell that made him convulse and shrivel up. It is far more in keeping with the discussion of magic in the Enneads that Plotinus was able to defeat his enemy's magic by remaining focused on the Genuine Good, and that the spell recoiled upon the one who cast it because of his own malevolence and unreasoning susceptibility.